During the Malaise Era, there were periods in which diesel fuel was way cheaper than gasoline (or at least more obtainable during periods of gas lines, odd- and even-day rationing, and so on). As a result, GM slapped together some miserably unreliable diesel V8s and dropped them in some midsize cars, with results we really don't need to go into here. 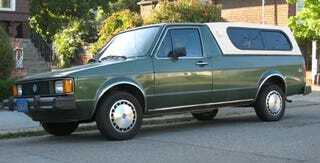 Meanwhile, VW put a bulletproof- if gutless- diesel four in the Rabbit, which sold... like crap. Too bad the Rabbit pickup was never much of a seller, because with 25 years under its belt it's actually not a bad-looking vehicle by today's standards. Of course, the diesel Rabbit pickup was on the sluggish side (well, actually it was dangerously underpowered; negotiating an uphill freeway onramp in one with even a moderate load would have you pleading with the Blessed Mother of Acceleration to dole out an extra five horses, just for a few seconds), but they got awe-inspiring fuel economy and are now highly sought-after by the vegetable-oil-fueled-car crowd. We'll take one! The VW Pickup Lives! We Didn&apos;t Know!